Leanne Caret, head of Boeing’s defense division, is presiding over a resurgence for the Super Hornet and another Boeing fighter, the F-15 Strike Eagle. It wasn’t so long ago that Leanne Caret, head of Boeing’s defense division, was warning of a grim future for one of the plane maker’s marquee fighter jets. As finance chief of the business, Caret helped draft a disclosure tucked into the company’s 2014 annual report saying production of the F/A-18 Super Hornet was at risk of shutting down by 2018 due to stalled sales. But doomsday never came for the plane — and Caret is now presiding over a resurgence for the Super Hornet and another Boeing fighter, the F-15 Strike Eagle. With those planes enjoying unlikely comebacks, Caret is focusing on a tougher goal: restoring growth. The military business has shrunk as government budgets sagged and Boeing lost out to Lockheed Martin and Northrop Grumman on next-generation U.S. aircraft programs. Boeing’s long-delayed tanker is poised to bring fresh momentum. Caret is also angling to win Pentagon contests for a trainer jet and a refueling drone. That’s giving the 51-year-old executive the chance to bolster the $21 billion defense division, overshadowed as Boeing’s commercial-jet sales boomed this decade. 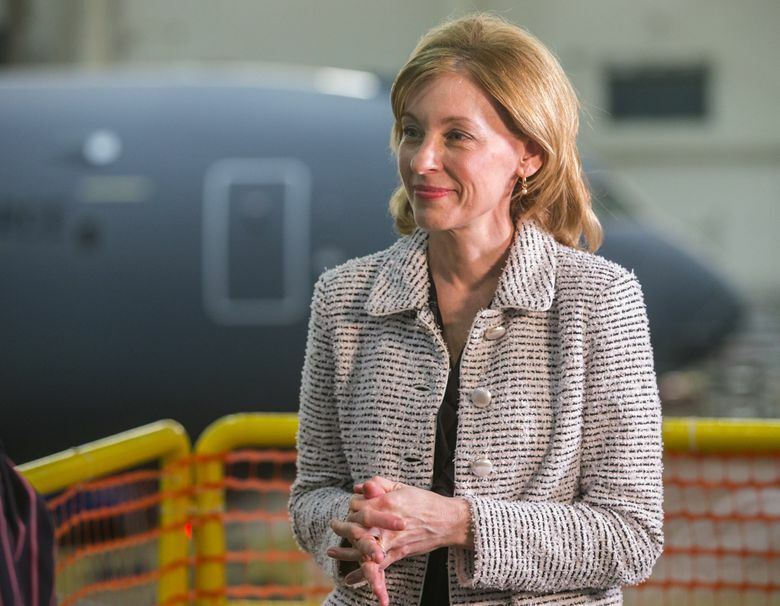 She took the reins of Boeing’s Defense, Space & Security division two years ago, promoted by Chief Executive Officer Dennis Muilenburg — himself a former head of the unit. Caret, sunny and self-effacing in person, is every bit as driven as her Diet Mountain Dew-swilling boss, said Loren Thompson, a defense analyst at the Lexington Institute who knows both executives and has done work for Boeing. “She is unfailingly courteous and engaging, but never misses an opportunity to undercut her competitors,” Thompson said in an interview. Caret’s got her share of hurdles to overcome. The company is scheduled to deliver the first plane from its biggest new military franchise, the KC-46 tanker, in October. But that’s after the aerial gas station has generated cost overruns totaling $3.4 billion, including a charge that marred Boeing’s earnings report last month. On another front, the aerospace giant is falling behind Elon Musk’s SpaceX in the race to be the first company to ferry U.S. astronauts to the International Space Station. Part of Boeing’s delay arose from a propellant leak in June during a launch-abort engine test in New Mexico. Still, Caret is reaping new orders and services revenue from Boeing fighter jets many had dismissed. Lockheed was supposed to render Boeing’s decades-old warplanes obsolete with its F-35 Lightning II, also known as the Joint Strike Fighter. But these days Boeing is finding success pitching its aircraft as cheaper, lower maintenance and highly capable companions to the stealthy F-35, the Pentagon’s costliest weapons system. In one closely watched contest, Israel is weighing ordering about two dozen F-15 fighters against taking more of the F-35. If the deal goes Boeing’s way, Israel would become the first Joint Strike Fighter customer to place an add-on order for the 45-year-old F-15. Such an outcome isn’t outlandish. Regional rivals Qatar and Saudi Arabia are loading up on more advanced versions of the Strike Eagle. Any Israeli air offensive is likely to be a joint attack using both aircraft, said Sason Hadad, who retired last year as a brigadier general. The F-35 would be needed for its stealth capacity, while the F-15 would bring maneuverability and ability to carry a much heavier payload, he said. Israel has bought about 50 F-35s and in May became the first country to use it in combat — in Syria. Hadad, a researcher at the Institute for National Security Studies in Tel Aviv, said Israel now needs to build up its fleet of F-15s. “The dilemma is real and the decisions are being made now,” he said. Boeing is also discussing an upgrade known as the F-15X with the U.S. Air Force, said a person familiar with the matter. While the Pentagon last ordered the twin-engine fighter in the 2001-2002 time frame, the U.S. Air Force would benefit from technology investments already made by international customers like Saudi Arabia, including glass cockpit displays, enhanced radar and fly-by-wire controls. The proposed variant would also have an eye-popping payload of 22 air-to-air missiles, according to an account of the talks published by TheDrive.com. That compares with 12 for the Saudi version and eight for the F-15E currently flown by the U.S. 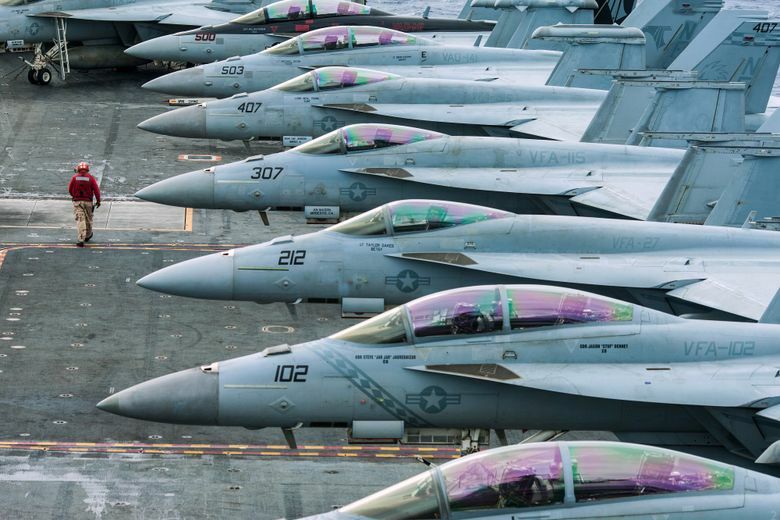 The Super Hornet, designed to land on aircraft carrier decks, is also enjoying a renaissance. A favorite of U.S. President Donald Trump, the jet is seeing renewed sales to help bolster the Navy’s air wing that was stretched thin by budget cuts and delays to the F-35C, said George Ferguson, an analyst with Bloomberg Intelligence. The U.S. Congress has approved a military budget that would add 24 Super Hornets in fiscal 2019, and 110 jets through 2023. The Obama administration had proposed ending purchases of the plane this year. There are potential overseas sales as well: Finland is looking at the EA-18G Growler, a variant that jams electronic communications. Meanwhile, Germany, India and Switzerland are studying the F/A-18, said a Boeing executive who wasn’t authorized to speak publicly. Another potential customer: Canada. Despite a public falling out and a canceled order after a Boeing-initiated trade spat last year, the two sides have continued to hold robust talks. Boeing met with Canadian officials several times this summer, including at the Farnborough trade expo, the executive said. Then there are two important new franchises expected to be awarded by the Pentagon over the next few months: a $16 billion contract for T-X trainer jets to hone the flying skills of military pilots, and the $7 billion MQ-25 program to provide carrier-based refueling drones. Both pit Boeing against Lockheed. Aerospace pundits have suggested that Boeing’s military-aircraft manufacturing hub in St. Louis may ultimately be at stake in those contests. Caret politely deflects the thought. “No single win or loss defines us,” she said.